I can't believe we have been married for almost 11yrs now. We have been through so much 15 years you serving raising four children. I still close my eyes and see the man who seen something different in me. When we met I was a single mother of two kids. Raising them on my own. Their real father walked out and it was just me. I began to believe it would always be just me. No one would ever see me as anything other than a girl with two kids. I met you thinking he will be the same as everyone else no different. I was so wrong you came into my life and really seen me for me. I remember being terrified of you I just couldn't understand the warmth of your heart and the gentleness of you. I had never met someone like you. I always knew you were different. We dated for a month and you stepped up and took my kids as your own. I just was so amazed wow is this real. You asked me to marry you on my son's birthday. Which I never saw coming after a little over a month. But I knew you were different and I said yes. I was definitely a little scared because then we got word you would deploy but it was a chance worth taking. After your second deployment I could tell you where not yourself and it scared me. You became so angry and shielded from me and the kids. I tried to talk to you but you wouldn't let me in. But I knew who you really were so I tried to always understand. But after years of fights and you trying to take your life I knew things were not OK. You realized you needed help and got counseling for PTSD. It was not easy for either one of us but I knew we had to do this to save you and me. We have come so far together and I realize every day how much I need you in my life because without you I would be different. You are such an amazing person and have so much to give I am so great full you picked me to grow old with. I love you and honor you and will always be by your side. 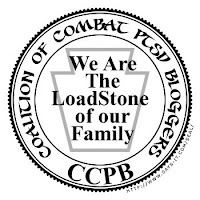 You have faced PTSD and not let it over come us and because of that we are so different we are stronger. This blog post is part of The Love Letter Campaign... a project started by FamilyOfaVet.com to encourage those who love a hero to write a letter sharing their story (where they started, what they've faced together, and why their love endures). It's not just for spouses, but also for parents, siblings, caregivers, and friends. It's about telling the "rest" of our stories... stories that continue despite PTSD, TBI, and the challenges of life after combat. 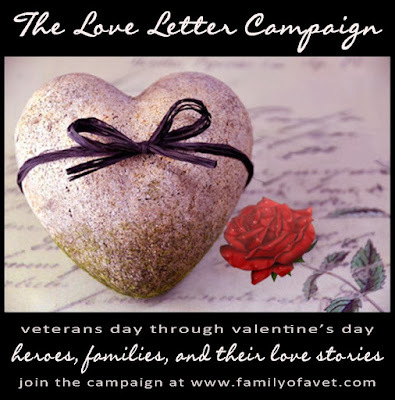 To share your love letter or find out more about the campaign, visit http://www.familyofavet.com/love_letters.html.